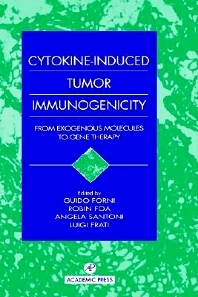 This remarkable book focuses on the field of cytokines and tumor immunogenicity, in which there has been a recent resurgence of interest, especially with the advent of gene therapy. With major sections devoted to concepts, experimental models, and clinical perspectives, this volume includes chapters from nearly every research group actively contributing to this area. The excitement that pervades the field is captured, and the prospects for the future discussed. The information presented here will provide essential reading for a wide spectrum of basic as well as clinical investigators interested in cytokines and the prospects for successful cancer therapy. AUDIENCE: Researchers in basic immunology, and cancer biology, as well as clinicians working in research. Preface. Concepts. Experimental Models. Clinical Perspectives. Conclusions.